Posted by globalizer in global access. Nothing to add, this says it all. Update: this says some more. Posted by globalizer in global access, Language, Translation. Spanish is one language. While there are a few terminology areas with words that vary a lot from country to country — like culinary and apparel terms — native speakers agree that by now everybody is used to the Microsoft Spanish standard for software user interfaces. In the vast majority of cases, two or more versions of Spanish are not required, except for marketing purposes. This is one of the most persistent myths that lives on in the halls of software companies – that you absolutely have to produce at least two Spanish language versions of your software, one for Spain, and one for Latin America (and in the extreme version, this morphs into a need for separate versions for each Spanish-speaking country in Latin America). I don’t know have many times I have had to swat away at this. Update: I should add that there are real pitfalls you have to watch out for, if you produce only one Spanish language version worldwide. Certain Spanish terms have such connotations in various Latin American countries that you do not want them to appear in your software, so you have to create “stop lists” with those terms. This does add a small wrinkle to the work of Spanish translators. Posted by globalizer in global access, International requirements, Social software. I am slowly wrapping my middle-aged synapses around the concepts of the XO Sugar interface, and with the addition of a public Jabber server that allows XO users to actually see each other and connect, the possibilities connected with collaboration are becoming more obvious. This allows me to connect with any of the other XO users who are online, and share any of my activities (the editor, a game, the browser) either with everybody or with specific users. The point is, of course, that once you have groups of kids with laptops in rural areas they will be able to connect with each other exactly like this via the mesh networks, without the need for either chat servers or even internet access. I knew this was the theory, but actually seeing and experiencing it definitely is an eye opener. Posted by globalizer in global access, International requirements, Keyboard layouts, Locales, Unicode. 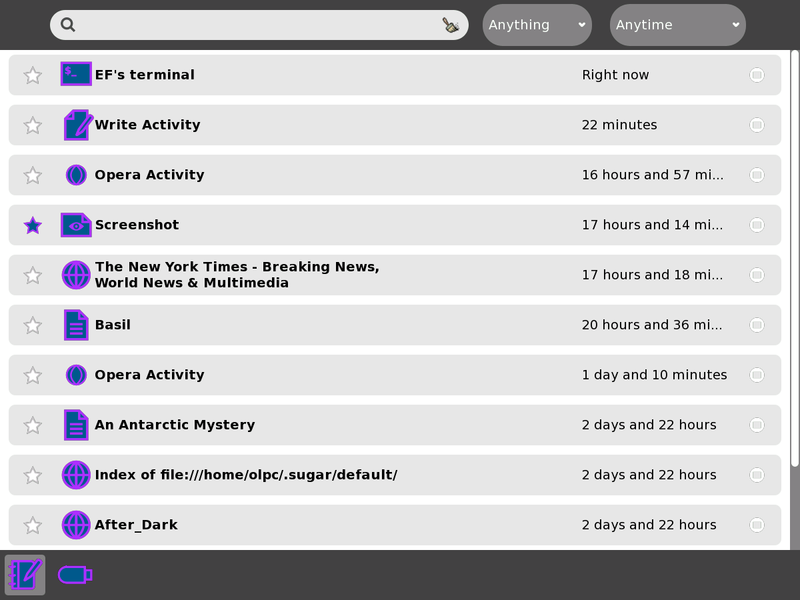 The Sugar user interface does take some getting used to, at least for anybody who has ever used a computer before. I am slowly learning that this has its advantages. For instance, if you go back to a terminal window instead of opening a new one, you can recall your keyboard commands with the up and down arrows, even though the system has been powered down in between. to download a file, for instance, you have no clue where the file is placed, so if you want to do something with it afterwards, you need to go to your journal to get it. This may very well be a good design when the target user group is supposed to be children who have never used (or even seen) a computer before, I just don’t know. I do know that the people exploring the Sugar interface right now via the G1G1 program are not the right people to test the usefulness of the design. Our brains are already hardwired to think along the lines of conventional computer interfaces as they have looked for the past 20 years or so. So it will be really interesting to see what happens when the machines hit more places like this and we get some real, hard data about how kids use them. Anyway, I have spent a little time exploring the internationalization support (naturally). The build that is included on the machines in this first shipment to G1G1 donors includes very little in the form of actual localizations, but I will get back to that (and the localization support) in a later post. The underlying Linux distribution (Fedora 7) and the Pango library for text layout have presumably been enlisted to do most of the heavy lifting in the i18n area; how many and what kind of improvements/changes the OLPC project have added is unclear to me right now. Documentation seems to be scattered in various places in the wiki, with information often being incomplete or irrelevant (e.g., this page about locales seems to contain merely an attempt at a generic description or definition of the concept, and then lists the locales included in the Mandriva Linux distribution – hardly very useful if you are trying to understand the OLPC project). Posted by globalizer in global access, Social software, Unicode. A couple of days before Christmas I received the two systems I ordered via the Give 1, Get 1 program, and I have spent the holidays exploring. 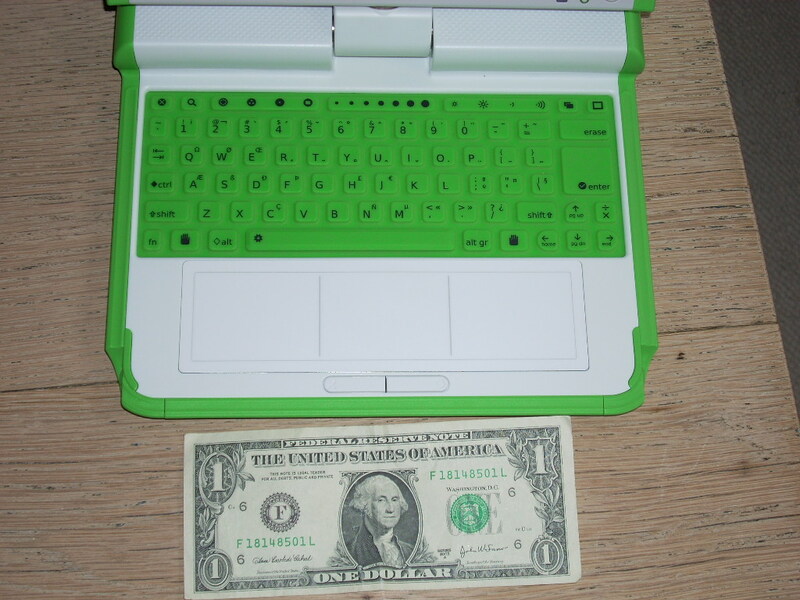 As you can see from the pictures above, with the 1-dollar bill for comparison, it is small, really small. The LCD screen is surprisingly good, though, and it will be interesting to try it out in the sun, to see if it actually is readable. With no rotating media (storage is exclusively flash memory), it should be able to handle quite a bit of rough handling. The system is also pleasantly quiet and cool – no fan! The hardware in general seems really sturdy (as it is supposed to be), and the sealed rubber-membrane keyboard would seem to offer good protection against dirt and dust. It is also the one part of the system where size does matter; it is very, very difficult to use for adults, and I would think that even many kids in the target audience might have difficulties – if we assume that children up to around 13 will be among the recipients. The wireless networking support works great – all I had to do was power the system up. On the first boot, with absolutely no configuration needed, the system found the 8 wireless access points in my neighborhood, indicating via the icons whether they have encryption enabled. And once I entered the WEP key for my own access point, the system connected without a glitch. I haven’t tried the “wireless mesh” networking yet, but the concept is great, with kids being able to connect without a wireless router. Similar experience with the USB connectors and SD card slot: any media I have thrown at it has been immediately recognized. I have not spent a lot of time with the built-in camera and video recorder, but they do work, and produce usable images/video. helps a good deal, however. OK, that’s it for some quick impressions, mostly hardware-related. Definitely a thumbs up. Next up, some observations about the software. Posted by globalizer in global access, Language, Localization. 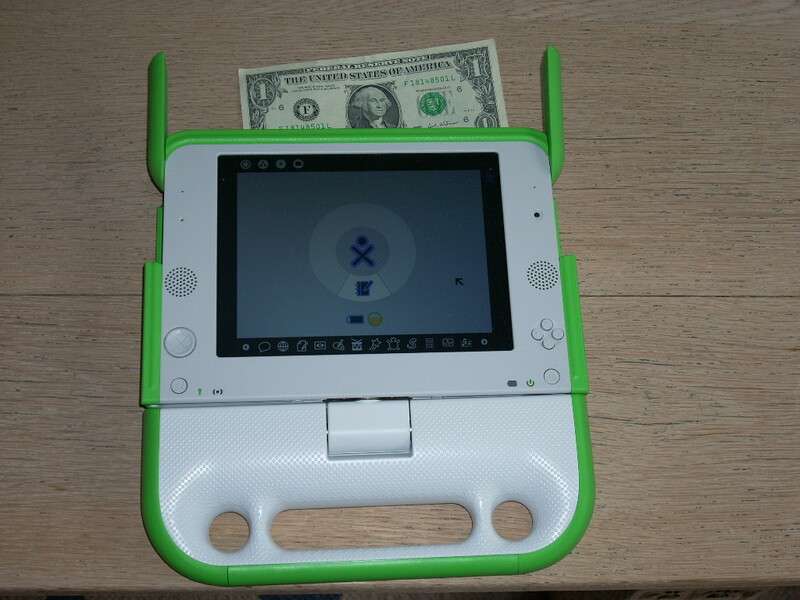 Just a quick link to the olpc wiki to highlight that the core languages for the project are quite a bit different from the sets of languages that mainstream software localization usually targets, simply because they aim at providing coverage in developing countries. I am sure that a few of those languages will pose some interesting challenges. 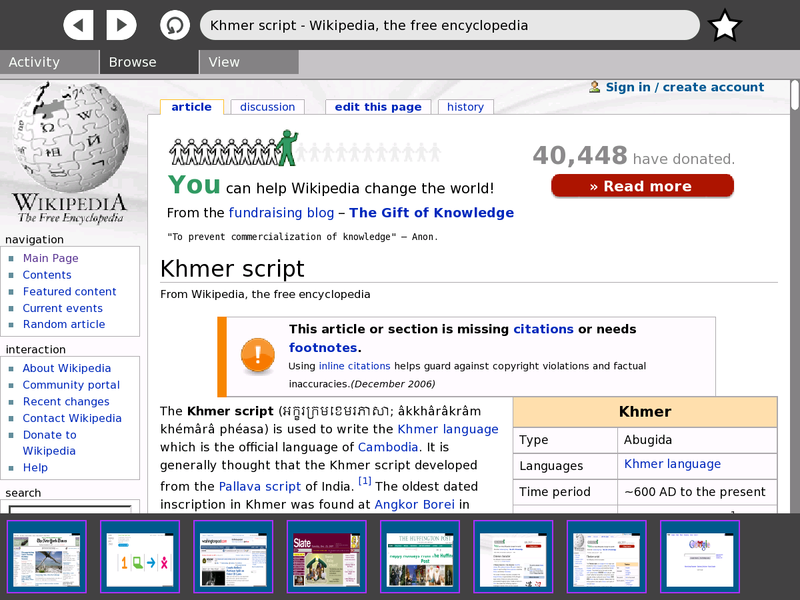 Unfortunately the wiki does not provide a very clear picture of the status of the various languages – exactly how much of the user interface is currently translated, for instance. Posted by globalizer in global access, Localization. A laptop, that is. 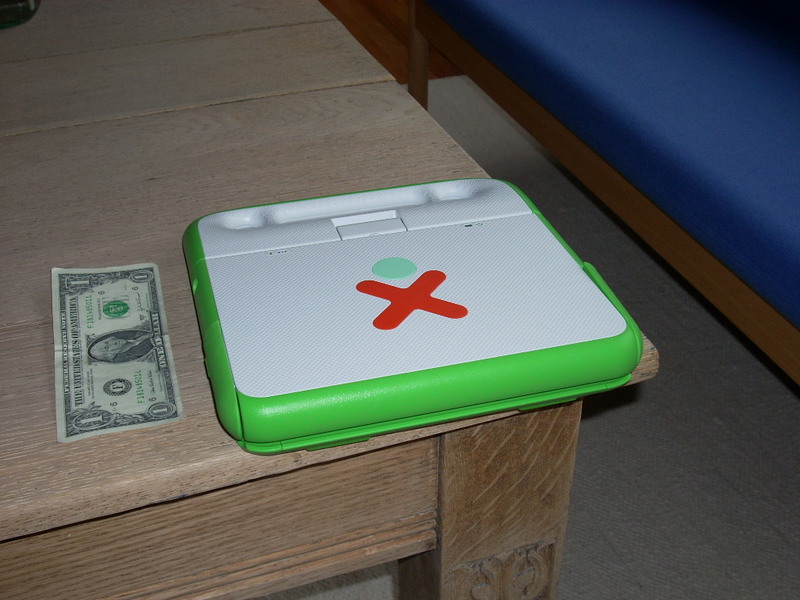 You have just 2 weeks to get your hands on the very cool XO laptop produced for the One laptop per child project. And at the same time donate a laptop to a child in a developing country. I saw a laptop prototype at the 30th Internationalization and Unicode conference where Nicholas Negroponte was the keynote speaker, and it was definitely a very different experience from your run-of-the-mill laptop, but also definitely one I would like to explore more. For one thing, if the connectivity works, it would be the perfect travel laptop – TSA could do their damnedest to it during security checks, and it would still come through unscathed. And Negroponte was a hugely entertaining and engaging speaker, btw.